backpacker indonesia :Prof. Dr. Dr. KPH Soejono Prawirohadikusumo, SPS, SpKj (K) as the foundation's founder and chairman of the museum, he was inspired to establish the Puppet Museum in Yogyakarta at the time he witnessed the museums in the Netherlands around the year 1967. At that time, he was educated in the Netherlands S2. Upon their return from the Netherlands, this Pakualaman Puro relatives began to collect puppets, and gradually build up to the Wayang Museum was completed in 1987 which was marked by Surya Sengkala "Kekayon Siyaga Angesti Wiyata". The museum was inaugurated by the Governor of Yogyakarta at the time KGPAA Paku Alam VIII on January 5, 1991. Approximately 90% collection Puppet Museum is a private collection, the rest is a grant and deposit of puppet art lovers. Destination Establishment, Museum Wayang Kekayon Yogyakarta is preservation of national culture, especially culture, puppets and things associated with that goal. As a tourist destination, the museum has the function of education, vehicle research, and recreation. The museum complex consists of one (1) the auditorium with audio visual facilities used for the initial explanations for visitors as well as ten units of the museum building. 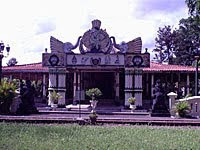 Main building with unique architecture of Java, complete with crest, pendapa, longkang, peringgitan, ndalem with sarean middle. Building a broad Pendapa can be used for various events ie weddings, meetings, art exercises, and tour packages to dinner while watching the performances of wayang, History of Indonesia in the park, ranging from the complex early humans two million years ago until the complex sculptures Proclamation 1945, Page that beautiful forest surrounded by rare plants as well as tourism. Other tourist facilities of camp souvenirs, a large undercover parking, and cafe. Purwa puppet style of Yogyakarta, Surakarta, Wayang Purwa style, middle, and Gedhog Wayang, Wayang Klithik, Krucil, and Lyrics Click Puppet Madura, Dupara, Kartasuran, Kidang Kencana, and others, Wayang Bali, Suluh, Menak Marionette, Marionette Tengul, and others, Wayang Java, said, Diponegaran, Marionette smacking, True, and others, various mask, Yogyakarta, Bali & various traditional arts, Contemporary Wayang, Wayang Thailand, United States, India, and others, Wayang a century , a special palace, etc.